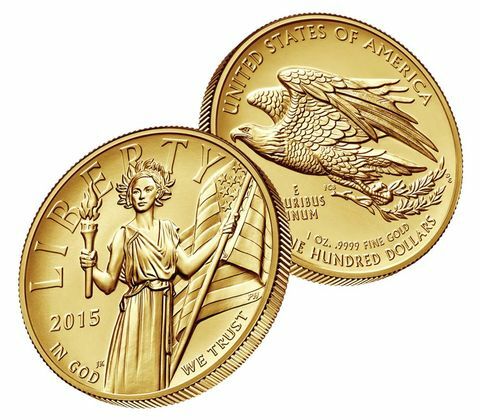 The United States Mint has released a new coin for 2015 which harkens back to the Golden Age of coin minting – The 2015 American Liberty High Relief Gold Coin. Arguably America’s most famous coin engraver/sculptor, Augustus Saint-Gauden was the designer of the ever-popular gold $20 Double Eagle. In 1907, only about 20 of these coins were minted. Because of the intricate detail and the level of relief that Saint-Gaudens sought after, it took up to 11 strikes to create one coin. Because of the intricacy and the level of relief needed to create it, the Ultra High Relief coins did not stack properly and were deemed unfit for commerce. The coin was then adapted into a High Relief version to where only 8 strikes were necessary. These coins were produced for one year with 12,317 coins minted. Again the design was modified to a standard-relief version and were minted from 1907 to 1933. Although the high relief and ultra high relief coins were only produced for one year, they are come of the most sought after coins in numismatics (an ultra high relief Saint Gaudens was sold for close to $3 million dollars in 2005). The U.S. Mint decided to resurrect this design in 2009 and created a new version of the Ultra High Relief Double Eagle Gold Coin. It was a smashing success and the coins sold out very quickly. This year, the U.S. Mint is back again and attempting to capture numismatists’ fascination with high relief coins. They are ushering in a new era that harkens back to Saint-Gauden’s vision but combining contemporary designs with the latest in modern coin manufacturing technology. 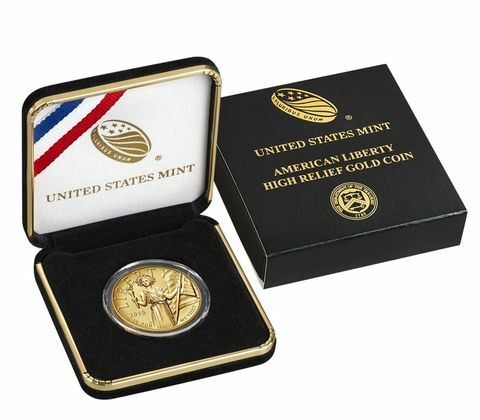 The result is the 2015 American Liberty High Relief Gold Coin. Designed by Justin Kunz, the 2015 Gold High Relief American Liberty obverse depicts a modern day rendition of Lady Liberty. Lady Liberty stands proud evoking the ideals of courage, hope and of course liberty. In her hands she holds a torch and an American flag. The reverse features a fresh eagle design, created by Paul Balan. The eagle is shown rising in flight with an olive branch gripped in its talons – a common depiction of American freedom. Each High Relief American Liberty gold coin is struck in beautiful .9999 fine 24-karat pure gold. The weight of each coin is 1 troy ounce and come individually encapsulated. The coin also is delivered in a black velvet-lined presentation case complete with a Certificate of Authenticity.